The woman was walking on a footpath between King Arthurs Way and Anton Lakes with her two year-old son at around 10:20am on Thursday 13 December. She was approached by two teenage boys, aged around 16 or 17 years old, who punched her in the stomach and demanded her wallet. They then took an ID card out of her wallet, snapped it in half, and handed the wallet back to her before walking off. He had distinctive blue eyes. He was wearing a black beanie hat black jacket and black tracksuit trousers with a white stripe on the side. 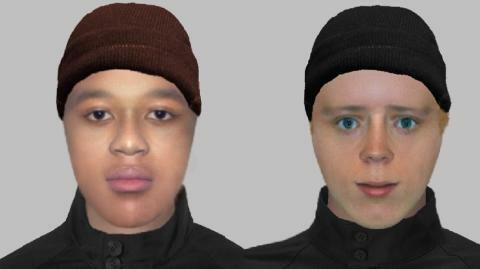 E-fit images of both teenagers are now attached to this appeal. Anyone who saw what happened or who saw the teenagers in the area at the time is asked to call 101 quoting 44180463803.